Sunflowers are in the last stage of their bloom, hay is being cut and bailed, and school is already back in session. 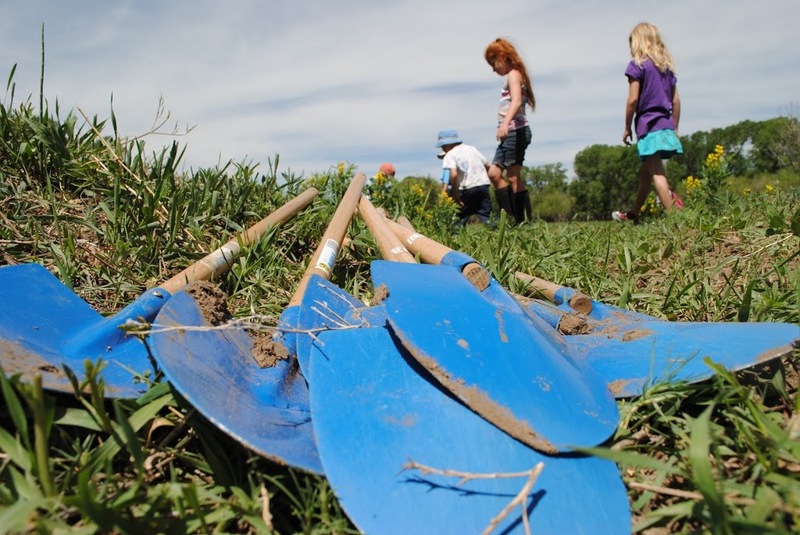 These are all indicators that Fall is approaching all too quickly in the Upper Arkansas Valley, but here at Guidestone the most surefire indicator that the seasons are changing is that we’ve wrapped up the last of our 2013 Summer Farmhands programming. Our office at the Hutchinson Homestead Ranch & Learning Center is quiet – the constant cries of elation have moved on to other pastures. Guidestone ample material for that. By all measures it has been our most successful season yet! 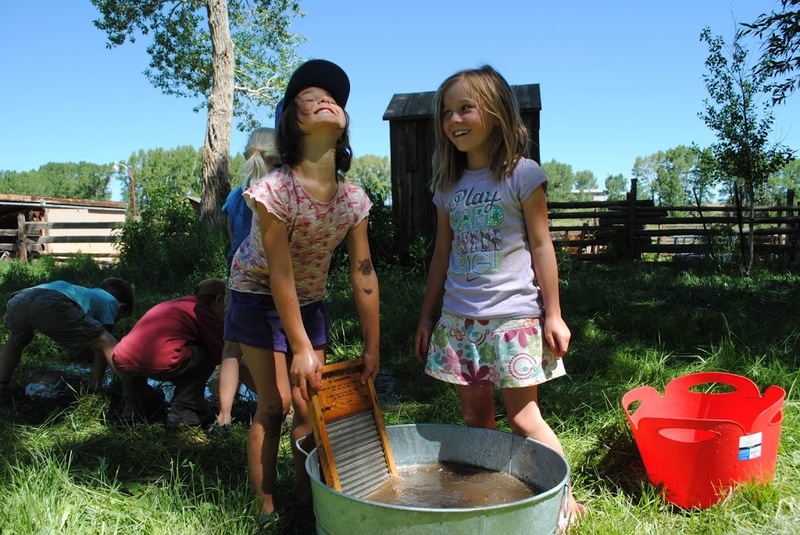 We debuted our new 4-day camp model, hosting 10 differently themed camps throughout the summer at three sites: Moonstone Farm, the Hutchinson Homestead, and Salida School Gardens – Holman Ave. site. These camps attracted over 90 students throughout the summer, many of whom were committed repeat campers. 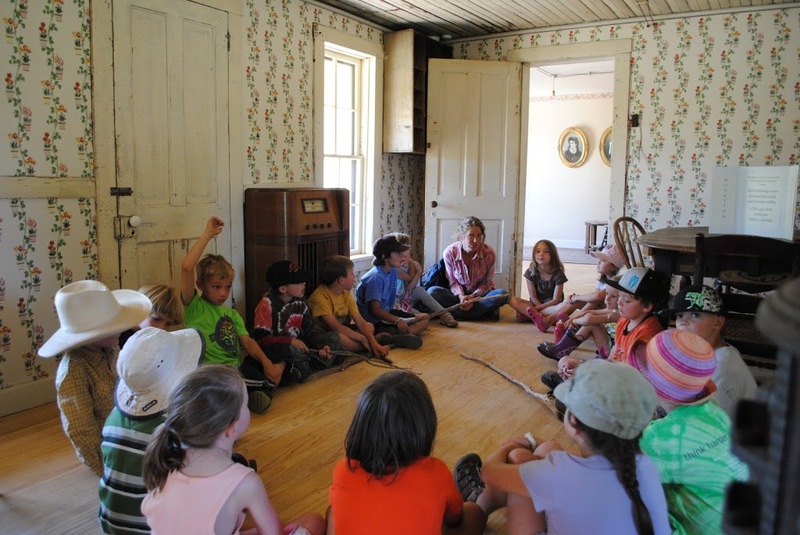 The diversity of sites where we held programs also contributed to the breadth of our summer programs. 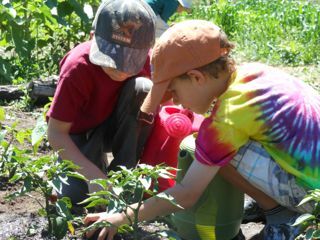 We partnered with the Morgan Center for Earth Literacy in Poncha Springs for the first time this season, which hosted our Little Sprouts, Garden Explorers, and Junior Farmers programs, which afforded the Farmhands kids the opportunity to get good and garden dirty while participating in food production firsthand. As we reflect on what went well this summer, we will also be thinking hard on how to make our programs even better for next season. An essential part of that is the feedback we get from the Farmhands’ parents, our instructors, and the kids themselves. That said, we’re ready to let summer go here at Guidestone and welcome the crisp mornings and warm colors that fall will bring, because with them comes our annual Pumpkin Patch Event! 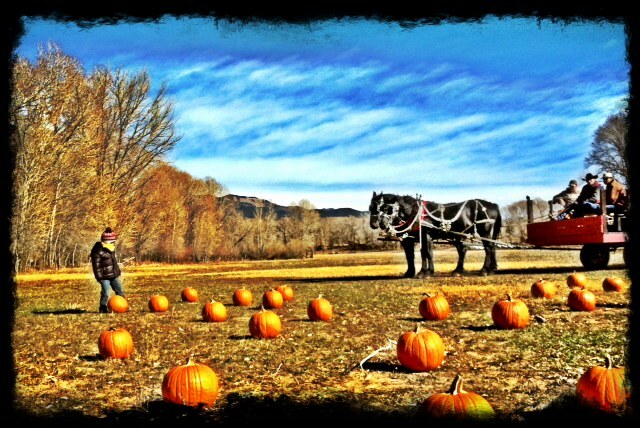 Save the date for the fun filled weekend of October 11-13 when there will be horse-drawn carriage rides with the wranglers from Arkansas Valley Trail Rides, a steak dinner and live-auction, music, children’s activities, pony rides, food, and of course… pumpkins! 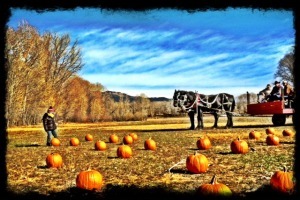 All at the Hutchinson Ranch. Ranch Campers sporting their well deserved gift from Coyote. Ranch Camp, one of our favorites here at Guidestone, started with a bang as Sneaky Coyote “stole” all the campers backpacks! Luckily, he’s not a pernicious coyote, only a sneaky one, which means that he left a riddle to lead the campers back to their packs, imploring them to “Learn from the land, hear the stories it tells – In forest or pasture, or down in a well – In trees, hay yards, ditches or crates – All of these places… Magic awaits! In 3 days time I will give you a test – So practice up now and pleez do your best.” And sure enough, Sneaky Coyote visited camp each day unseen by anyone – instructors included! 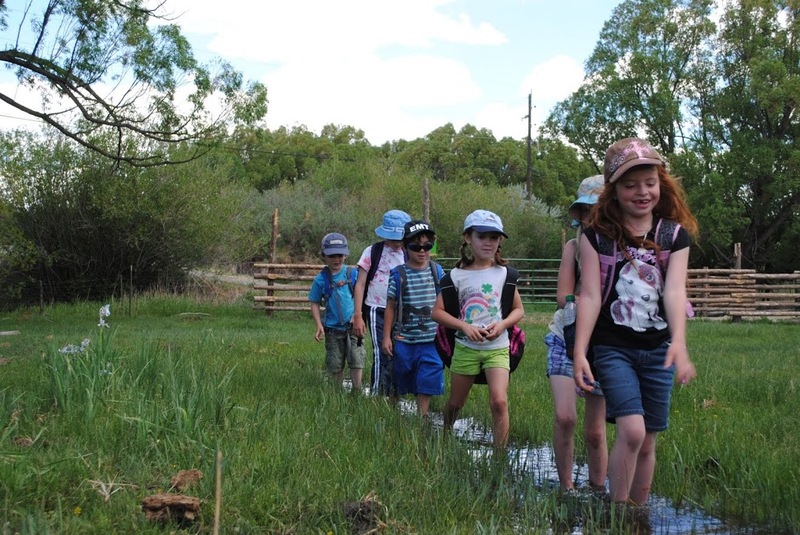 – playing pranks on the campers and leading them on a scavenger hunt that employed their knowledge of everything they’d learned about ranching on the last day. 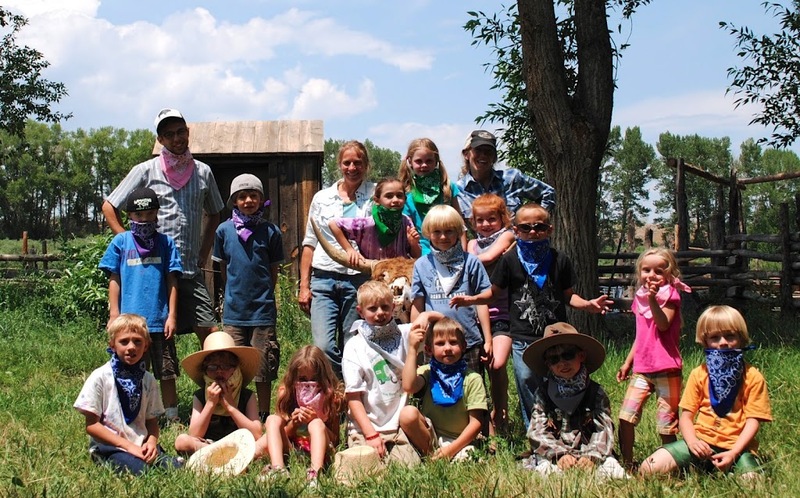 Coyote tested their knowledge of milking, branding, horse breeds, irrigation, and daily life from historic homesteading days, rewarding the hardworking campers with their very own bandana. A lesson in saddle crafting. Most fascinating about coyote’s antics on the ranch, which is what every camper remembers throughout the year and comes back to camp asking about, is the sheer sense of wonder that he evokes in the kids; wonder in the natural world, the sense that around every bend in the river an adventure awaits, or that even in a blade of grass or a ditch there is mystery and fun to be found. It was truly a thrill to see 15 eager faces light up when they realized that coyote had made off with the lassoes with which we were about to practice roping an cow skull and see every one of those faces race with all haste to find the lassoes in the pig shed. 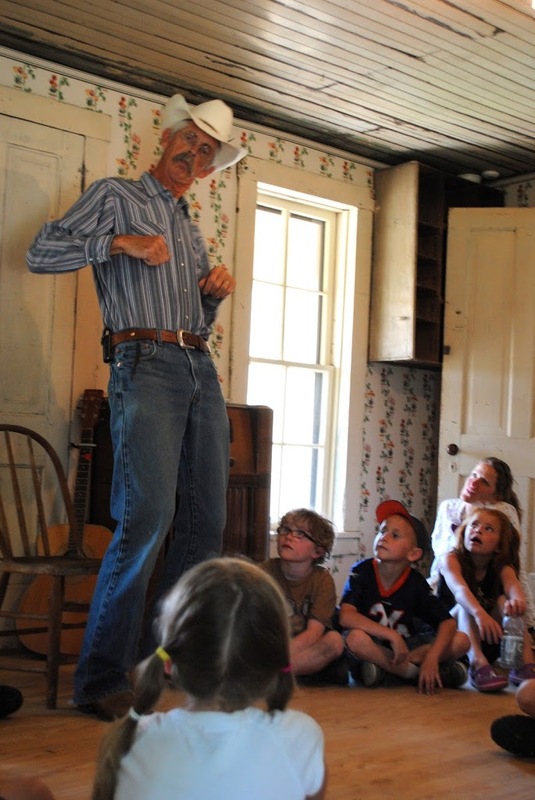 Wednesday, Dennis Fisher, came to share some of his Cowboy Poetry, songs, and stories with the group to much critical acclaim. Some highlights included how he acquired the name ‘Slim’ and why you never want to make the camp cook on a cattle drive angry. We closed out Ranch Camp with a genuine hoedown. The kids sang a song crafted at camp to their parents before leading them outside to square dance as Guidestone’s own Andrea Coen fiddled and called the dance. What a sight! The festivities were capped with ice cream made that day at camp with everyone taking a turn to churn. It was a great week of learning about the history of ranching in Colorado and the operations of a modern day ranch, all filled with fun. As Sneaky Coyote would say, “HA HA! HOO WHEE!” what a week! The last few weeks here at Guidestone’s headquarters have been packed! 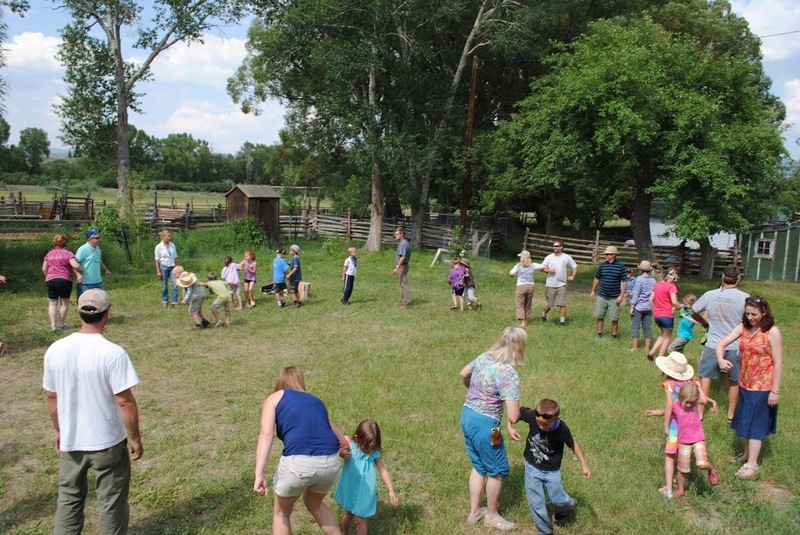 Beginning June 17-20 there was a true farmyard scene at the Hutchinson Homestead for Farmhands’ Animals on the Ranch Camp. 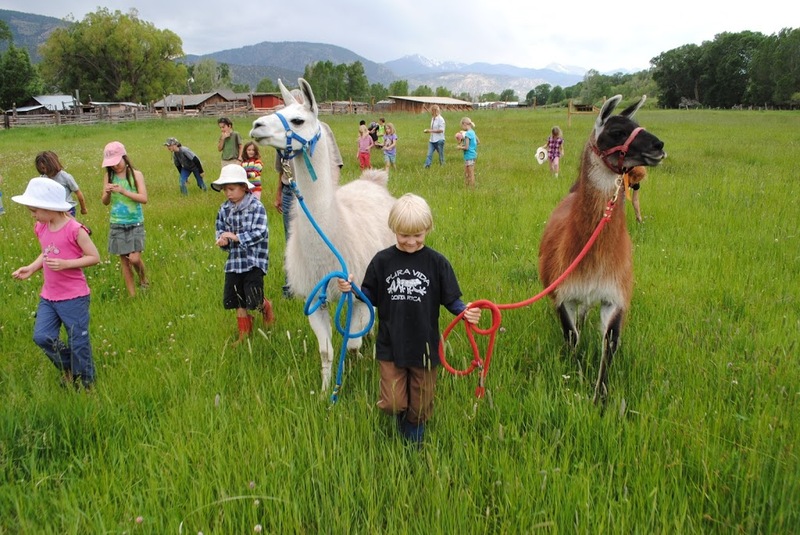 Jasper leads the llamas through the pasture. First off, our 22 (!) 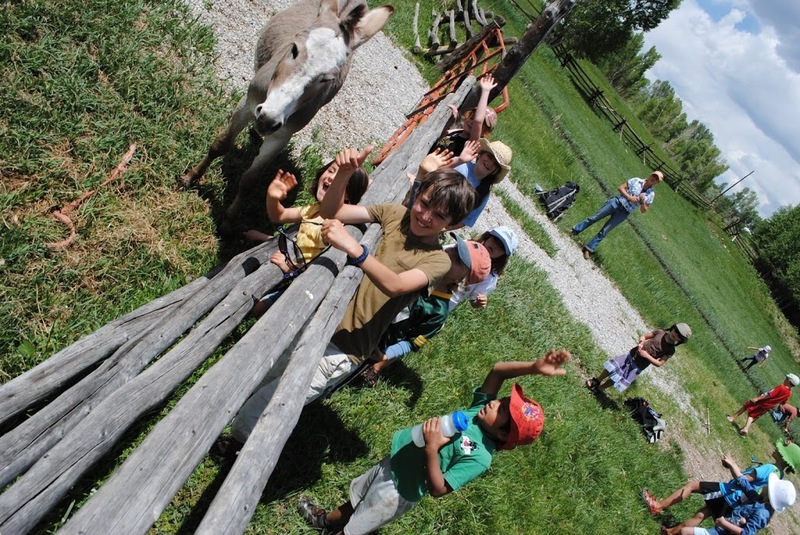 campers got to meet a few residents already on the ranch, including Smoky and Bucky the horses, Delbert the ever-sociable donkey, and Stella the milk cow. Everybody had a chance to see these animals in action, whether by milking Stella or watching as Smoky got shod (thanks to local farrier Harry Hansen for that great show!). In addition to the ranch locals, we also had some visitors: Little Red and Bunny the pack llamas from Bill Gardiner at Antero Llamas, a duo of Boer meat goats from Ellen Kelly at El Regalo Ranch, a flock of young laying hens from Guidestone’s own Andrea Coen, and a pair of turkeys from the homestead of Leisa Glass. Whew! 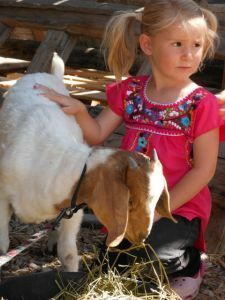 At the end of the week the kids had a solid sense of all the different animals on the ranch and their product – whether it be fiber, meat or dairy. Campers meet the El Regalo’s boer kids. Perhaps the more important synthesis of the week’s activities was the kid’s gradual discovery that ranches provide a home not just for domestic animals, but also for a wide variety of wild critters that might not have a home if not for the landscape of the ranch. 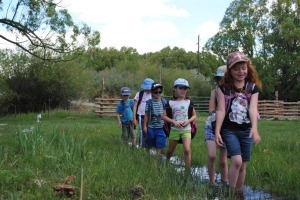 While out in the field we tuned our senses in to look for signs of wildlife, and boy did we find plenty! From the carcass of a red-tailed hawk, red-winged blackbird nests in the pasture, deer tracks, and beaver dams it seemed like everywhere we looked we saw evidence of a healthy ecosystem. 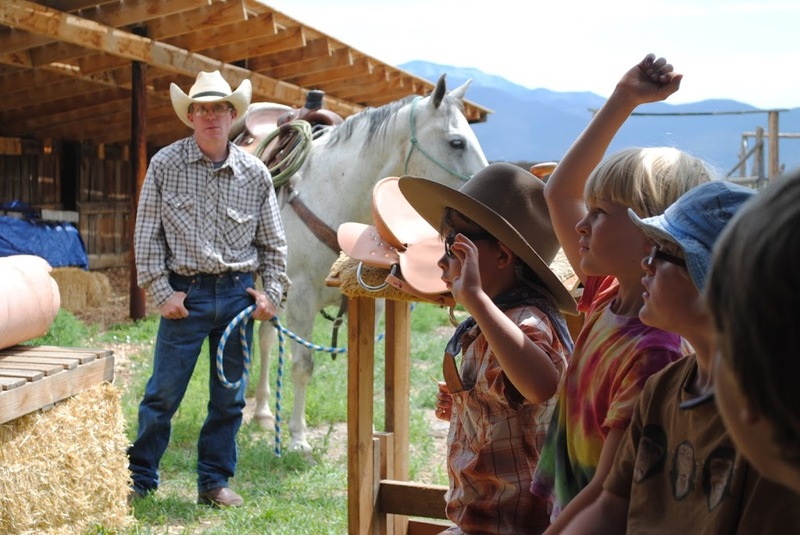 The good turnout continued the following week with 20 eager kids coming to the ranch to learn traditional homesteading skills during People on the Land. Over the course of the week camp participants got to try their hands at making butter, soap, and candles, spinning wool into bracelets, hand-washing laundry (who would’ve thought that’d be such a hit? 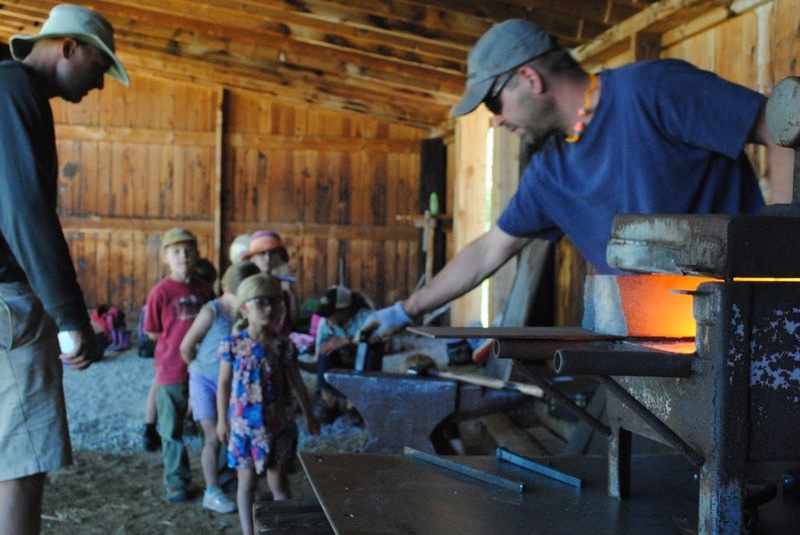 ), and even take a few swings at the blacksmith’s anvil when Jamie Monroe and his assistant Matt came to demonstrate how Annabel Hutchinson and company would’ve made their own tools in the late 1800s. At week’s end, the general consensus among the group was that the hard work that would’ve been demanded of them as homesteader children would have been… hard! Perhaps the chores are fun in short doses, with all your buddies doing them with you, but in the end the vote was overwhelmingly in favor of modern conveniences. In addition to an appreciation for the austere elements of life in the homesteading era, the kids started to grasp the connection between every material aspect of their lives and the land they live on – from the butter that comes straight from a cow’s udder, the warm clothes spun from fiber-bearing animals, or the objects that populate their lives’ origins as materials mined from the earth. By seeing the whole cycle on a few of these simple products, the kids were able to, after some pronunciation lessons, identify their role in the cycle of producer-consumer-decomposer. July is already upon us here at Guidestone and Farmhands programs have been in full swing. 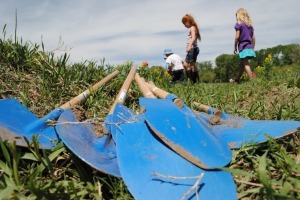 June 10th – just as Guidestone tried to contain its glee over moving into our new headquarters at Hutchinson Homestead Visitors Center – we kicked off summer programming just outside our office doors by welcoming an enthusiastic group of kids to Water and Landscape of the Ranch. Abby Hutchinson leads the fearless irrigators! We began the week with a quick game to orient us to the geography of water that provides the foundation of ranching in the Upper Arkansas Valley: from the South Arkansas’ origins to the west along the snow-capped Continental Divide to the headwaters of the Arkansas north in Leadville and those rivers confluence and eventual passage into the Gulf of Mexico. Nothing better than walking through a ditch. And with a sense of the land and water beneath our feet, we were off! 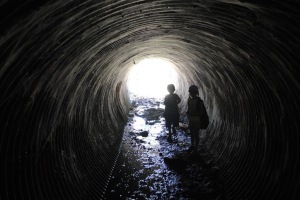 Into the culvert wide enough to drive cattle through and beneath Hwy. 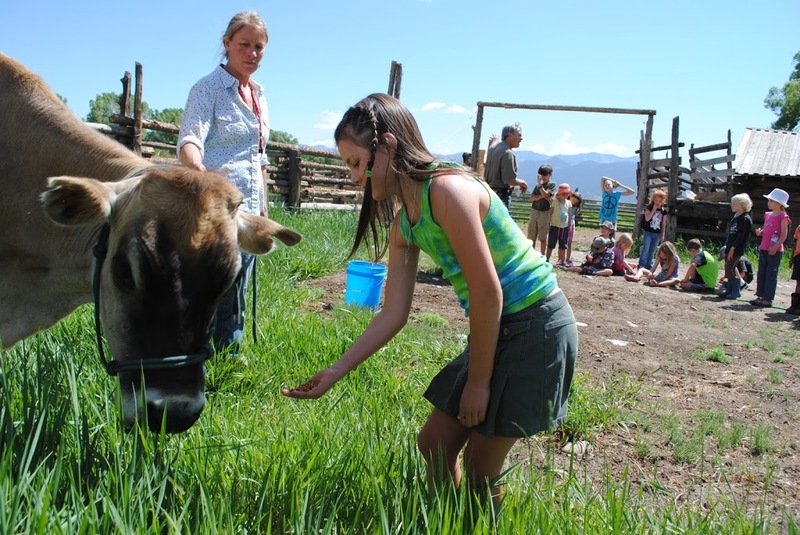 50 (a perennial kids’ favorite) over to the verdant pastures where the Hutchinson Ranch keeps its herd. 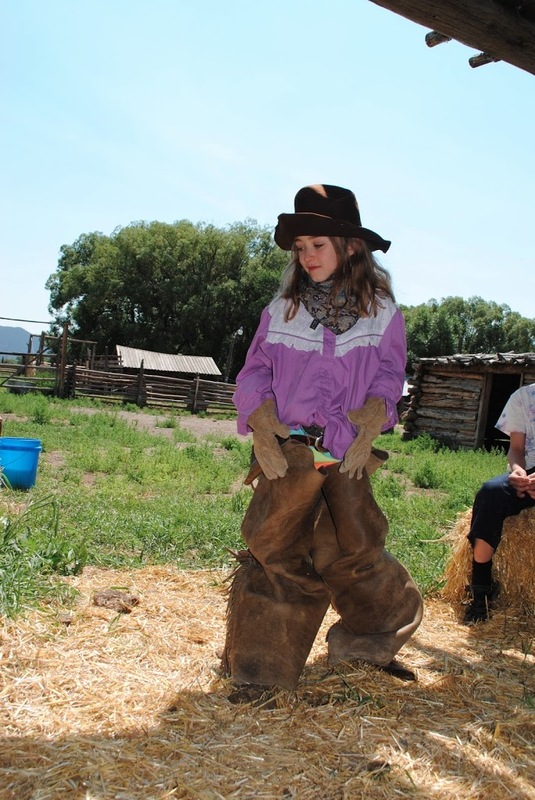 While there we met Abby, the sixth-generation of the Hutchinson family to ranch this land. Abby was quick to put eight eager kids to work with shovels, having them do what she only wished beavers would do in opportune places: build dams. 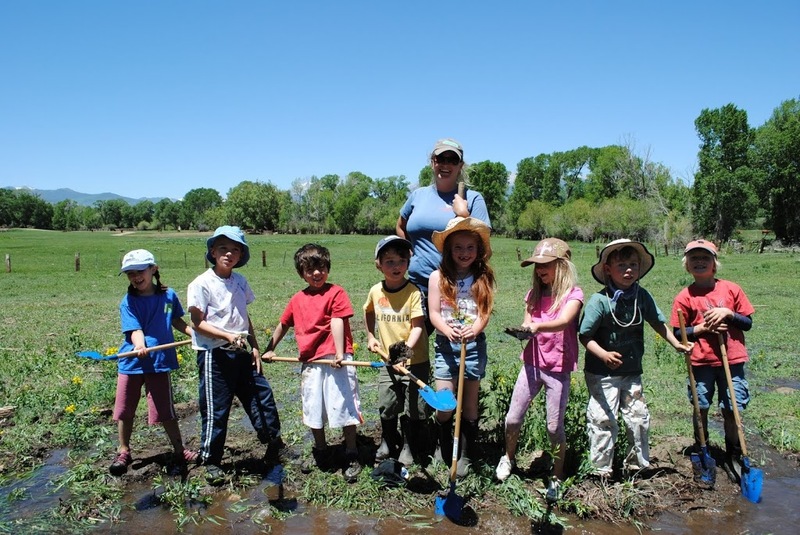 Over the course of the week, the kids, with remarkable enthusiasm and drive, focused on doing the hard work of flood irrigating by building channels for water to escape the ditch, strategically placing tarps to collect water, and removing impediments in the Briscoe Ditch. Future engineers shaping the river. Culvert to the south pastures. 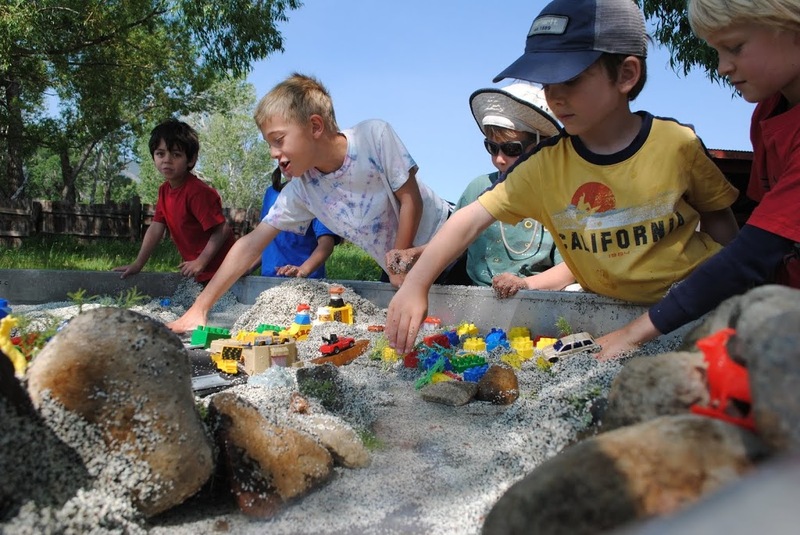 Perhaps most impressive about all this, from one humble educator’s perspective, was the sheer joy the kids found in their engagement with water. I watched as the reality of their own power to shape the landscape dawned on them and how they thought about the effects of their actions both down and upstream. By the end of the week, each camp participant could articulate how their efforts assisted the ranch’s hay crop, and how what happened on one part of the river affects manmade and natural communities below them; in this case, millions of people and hundreds of river miles from the South Arkansas River to the Gulf of Mexico. We can look forward to the day that they’re in charge. 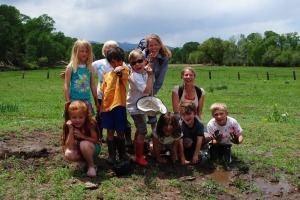 Intstructors Ann Stevenson & Andrea Coen send ’em home good and dirty! 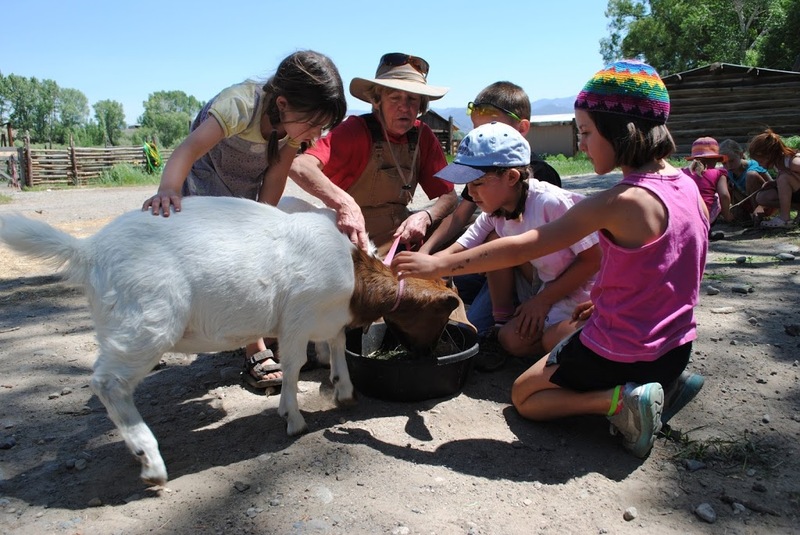 Registration is OPEN for Farmhands Summer Education Programs! 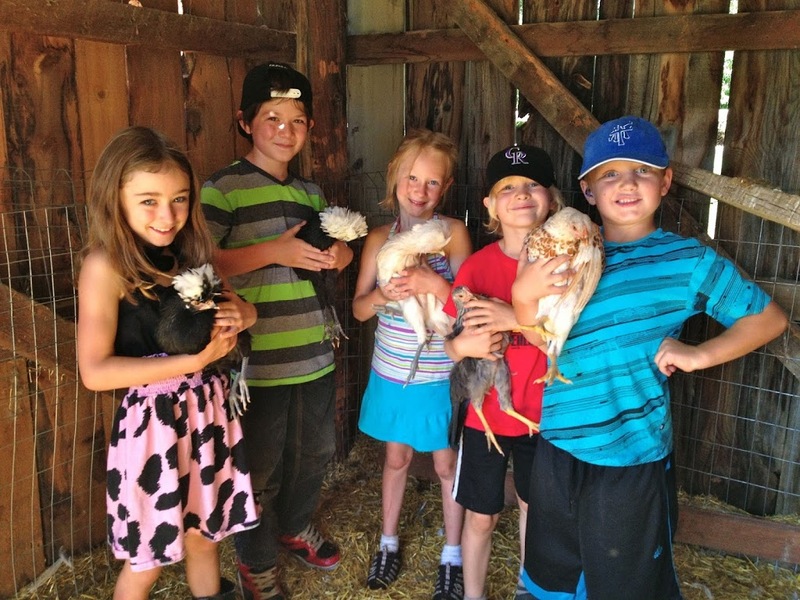 Register NOW to receive the Spring Chicken early-bird Rate for all of our Farmhands programs for Summer 2013!! Farmhands Youth Education Programs provide hands-on, experiential farm & ranch education opportunities for children of all ages, families and youth organizations! 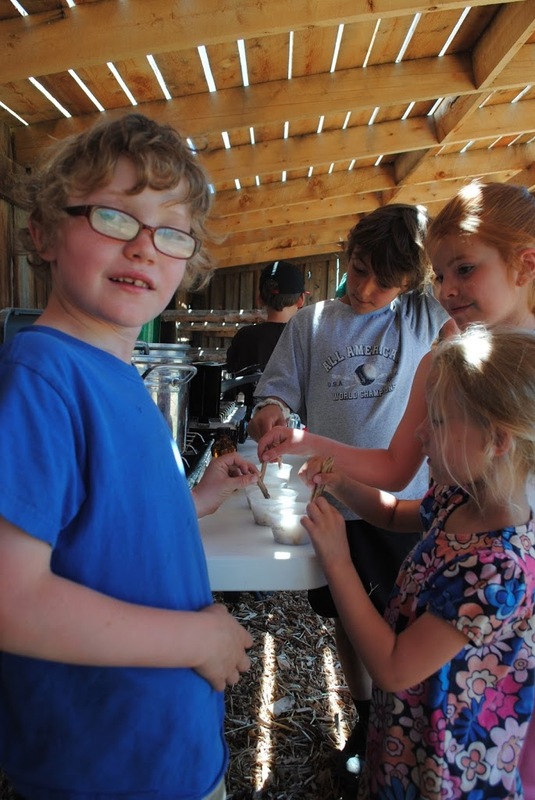 Farmhands programs have expanded this year both in numbers of programs and teaching locations! We have offerings for the following age distinctions: 4 and Under, 5 and Under, 5-7 Years, 7-10 Years, 10 and Up. 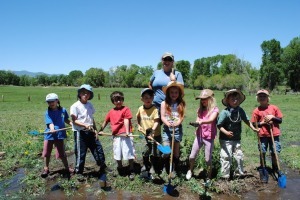 Teaching locations include the historic Hutchinson Homestead, The Morgan Center, Moonstone Farm and The Salida School Gardens. Advance Registration Required for all programs. To see a complete list of program descriptions, dates, ages, cost, locations and additional registration information, click HERE.